Known as the traditional symbol of youth and romantic love in Europe during the Middle Ages, it was once used to cast love spells, and was worn at weddings as a sign of happiness. 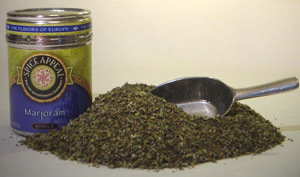 It has a fresh, spicy, bitter and slightly pungent flavor with a fresh and delicate, sweet aroma of thyme and sweet basil. Typically used in European fish sauces, clam chowder, butter-based sauces, salads, tomato-based sauces, vinegar, mushroom sauces and eggplant. Goes well with cabbages, potatoes and beans. Add to Italian tomato sauces, pizzas, fish dishes and vegetables.